This fine vintage advertisement for a 1977 ad for Raleigh Cigarettes is in excellent condition but is slightly yellowed. This vintage Tobacco Magazine ad measures approx. 8" x 11". This vintage Cigarette Magazine ad is suitable for framing. 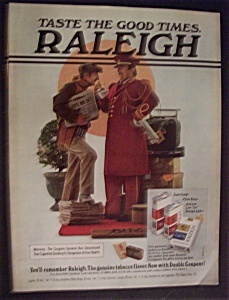 This vintage Raleigh Cigarette Magazine ad depicts a bell hop lighting a newspaper man's cigarette.